Anker is a company that make that bold of a statement as it was founded by gamers for gamers in an effort to bring a great gaming mouse to market and one that was affordable as well. Many of the high-end gaming peripherals get a huge price boost just by attaching the word GAMING upon it, but Anker keeps it real and at $39.99, and in some cases goes on sale for as low as $19.99, which is an amazing deal all around. Mouse itself is very light, good thing the weights are included. However, even with all 8 weights in place it still feels lighter than Logitech MX518, but certainly still comfortable. The weight cartridge, on the underside of the mouse when open, leaves gaps big enough to easily drop one of the weights inside the actual mouse body itself. When installed the weights are held in place and feel pretty sturdy. The buttons feel good, everything is pretty ergonomic and natural feeling. If I had a complaint there it would be that the thumb buttons seems a bit too easy to hit on accident when simply moving the mouse to the right but once u get used to it, you wont have any accidental clicks. The mouse wheel feels almost like a lid on a plastic bottle,but it's movement is precise. It has 4 lights next to the left finger button. These lights indicate your DPI so after some use you can begin to see where you've got it set. Personally I'll probably never use 8000 dpi, But it's very easy to cycle through dpi settings, another similarity to MX518. The software is pretty comprehensive. Keep in mind you have to download this from IAnker.com there is no install disk included with your package, perhaps Anker will change this later on but it seems kind of a waste of a disk for a 20meg piece of software. The problem Ive had here is in some games the key binding doesn't work in the typical way. I.E. click to change then press the key or mouse button you'd like to change it to. Instead you've got to reassign that mouse button through the mouse software to whatever the default key would be on your keyboard. An example would be, I want to change let's say my crouch key from "C" to "Mouse 6". I have to tab out of the game, open the mouse software, find mouse button six and reassign it to "C" on my keyboard for "mouse 6" to perform that operation. This doesn't happen very often, but it could be pretty inconvenient if you had a set of controls you wanted to completely re-map. 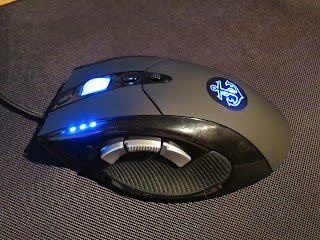 The light settings are pretty vibrant though you're only able to change the light color on the mouse logo. The presets look good but the software also allows you to change colors in a 16m color mode. There's even a check button for the light to "breathe", basically it just fades in and out every second or so. Sounds great if that's important to you except that everything aside from the presets tend to look nothing like what your custom color option may be. Personally this means almost nothing, but aesthetically it's a great touch if you can make the color you want the way you like it. This mouse can be customised, with up to 9 different keys - making it incredibly useful for any type of game. It also has a MACRO functionality that allows it to register your clicks and movements. 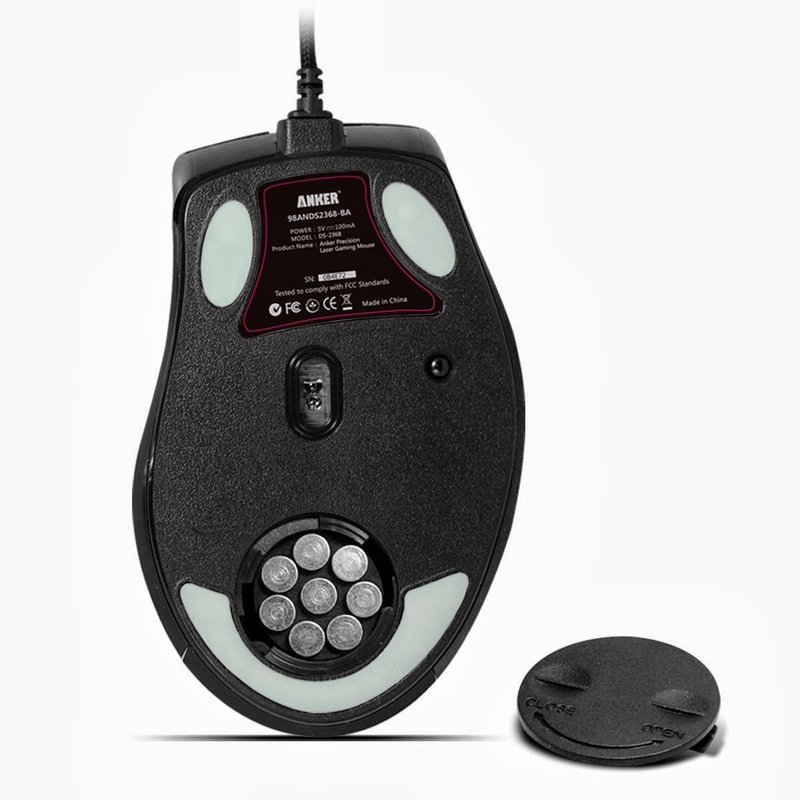 One of the main features of this mouse, and the eye candy behind it is the light colour on the anker logo - this can be changed to any colour of your preference, via the software provided. With an incredible 8000 DPI and 1000HZ polling rate, this mouse is one of the top dogs for precision. Although realistically I can't see anyone using it at 8000 DPI, and more like me at 2000 DPI, however the accuracy and response time of this mouse is outstanding. No lag, no input lag, no flaws, no jittery motion - in other words, it excels in doing what it is supposed to do. -Anker logo colour switch is hidden when in you, as you hand covers it - thus it would have been nice to be able to customise either/or the DPI switch and scroll wheel colours too. Conclusion: Overall, the motion is smooth, the fit is comfortable, the clicks aren't super loud, the optical camera and laser is very accurate, the software is pretty solid, and the price is right. Could it have benefited from a little bit more quality? Sure, but you'd be paying $60 or $70 instead of $40. It's good for the price.